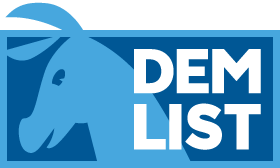 DemList, America's most comprehensive free resource for up-to-date information on events surrounding the Democratic Party, presidential primaries and Democratic Convention, is pleased to announce the launch of its National Calendar today. The new DemList Calendar provides its 10,000+ current registered users with access to state-by-state dates, details and deadlines for elections, legislative sessions and voter deadlines, as well as the schedule for Presidential primaries, debates and the US Congress. The only central resource of its kind, the DemList Calendar also offers a free forum for posting and promoting political events at the local, state and national level. DemList is working with Democratic party and convention officials to provide the most current updates to its followers from every US state, the territories and Democrats Abroad; and will serve as the hub for all information regarding events in Philadelphia during the Democratic National Convention in July. Founded and Published by longtime Democratic Political Consultant Kimberly Scott, the calendar will expand DemList's current offerings, which includes the highly popular DemDaily Newsletter. "Democratic success at the polls is people-driven, and providing a free, informative, effective platform for connecting people to the resources, issues and players goes to the heart of our mission." Started by Scott in 2008, "The List" quickly became the 'go-to' source for Democratic Party insiders looking for up-to-the-minute information on events taking place at the National Convention in Denver. In 2012 the formally-branded "DemList Calendar" and "DemDaily" newsletter reprised its role and served as the Party-promoted resource for the Democratic Convention -- as profiled in the LA Times, Politico, National Journal, Huffington Post, The Pittsburg-Post Gazette, Charlotte Observer and other publications, blogs and media outlets nationwide. Post-Convention, DemList became the central source for campaign, voter education and protection updates, as well as Obama (OFA) events, voter registration drives, canvassing and phone banks in targeted states. Convention Central: The first of the Official Schedule! The endorsement contest is usually an important factor in any presidential campaign — as a reflection of a candidate’s political connections and, often, their personalities.